It is not an exaggeration to say that without water, there would be no life. This is the reason why water has become such a precious commodity—we have dirtied our planet's water enough to make us buy water, and not only at a price, but a high enough price at that. Today, there are several methods of containing water for personal use. Each of us needs roughly eight glasses of water everyday, and most of it comes from mineral, filtrated, or purified water that we buy from the store. To show comparative costs, bottled water will cost around $0.25 to $2, while tap water costs less than a penny, and yet bottled water is still the preferred beverage. The portability and advertised purity of bottled water is enough for consumers to choose it over others despite the costs. 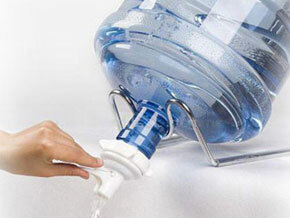 There are three kinds of drinking water containers generally in use today, each with its own set of advantages and disadvantages. Cost can certainly influence people’s preference, along with several other factors. The first kind of container is made of plastic. Plastic bottles for potable water are not reusable. The bottle itself can be recycled, but reuse allows the plastic to leach chemicals such as BPA and phthalate into the water that you drink. Aside from the fact that plastic as a rule is not environment-friendly, this chemical leaching further lessens its popularity. Even then, from a business point of view, the use of plastic bottles is more cost-effective and easier to transport and deliver, allowing cheaper plastic to a larger share of the water bottle market than it should. The second type of drinking water containers would be the glass water bottle. A major drawback of the glass water bottle is that it is breakable. And to address this problem, some water bottles are now coated with silicone or rubber to help prevent the bottle from accidental breaking. But as a container, glass is inert, perfect for preserving the purity of the water. And aside from being inert, it is reusable and recyclable as well. The third type of water bottle is the aluminum water bottle. It also preserves water fairly well, and it is reusable and recyclable. However, a common complaint to aluminum water bottles is that while it does not have the fragility of glass, the water it contains sometimes has a metallic aftertaste, as if the aluminum affects the water. Unfortunately, market demand decides which is the best among the different types of drinking water containers, not science or health consciousness. While there has been a definite rise in the awareness of plastics as an environmental hazard, it is still very much in use. The logical choice for water bottles should be glass, even if neither business profitability nor demand shows this. In any case, the most important aspect to consider is that water remains as potable and drinkable as it should be, and the choice of containers is part and parcel of its purity.